For nearly half a century, Valley Art Center has been at the forefront of visual arts education in Cuyahoga County and beyond. We offer classes and workshops year-round with some of the region's finest working artists as instructors. 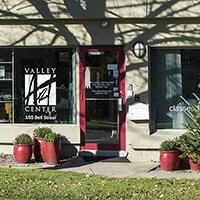 Valley Art Center's large, updated facilities include five classrooms fully equipped for learning ceramics, painting, jewelry, sculpture and other fine art and craft media. Our students, novice to experienced, are encouraged to learn and enjoy the entire art experience from the process of art making to the rewards of exhibition.